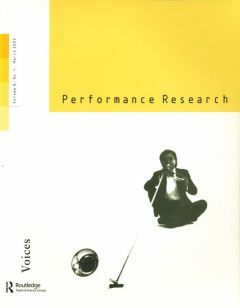 Voices will be the opening issue of a new volume (PR Vol.8, Nos 1–4, 2003) dealing with the body and the senses in performance. The subsequent issues will be Bodiescapes, On Smell and Moving Bodies. 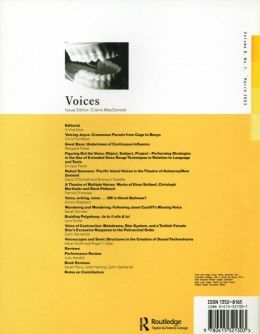 Voices will consider ‘voice’ in as wide a range of contexts and manifestations as possible – both real voices and metaphorical voices, the politics of the voice and the history of the voice, the nature of sound and its absence. ‘Voices’ will explore the relationship between the sonic and the textual, between listening and reading and between eye and ear. Work on sound poetry, on the history of the voice, on music, on sound-art and its possible relationship to the inscribed and printed page as well as considerations of the voice across the performance and visual arts will be included in the issue. The editors are interested in visual and textual work that makes use of the resources of the page, and in work that may use several versions of a text. Voice, writing, noise… OR is Herod Balinese?